“Hi folks, it’s me Jimmy, come closer”. I’ve just dropped in to tell you a bit more about this programme. As Eamonn explains at the start I accidently bumped into my Sister-in-law Evelyn coming out of Oxford Circus Tube Station in London the day before he was to surprise me with his Red Book at a building site which I was meant to visit to promote a book I had written called, “Letters for my Mammy”. Five minutes later when I mentioned it to my agent about the coincidence, and she phoned the TV people the programme was in grave danger of being cancelled. Luckily during of the secret meetings in the preparation of the programme in order to get a double surprise at the end, my wife was told that due to illness her sister would be unable to fly over. That’s how the programme was saved. 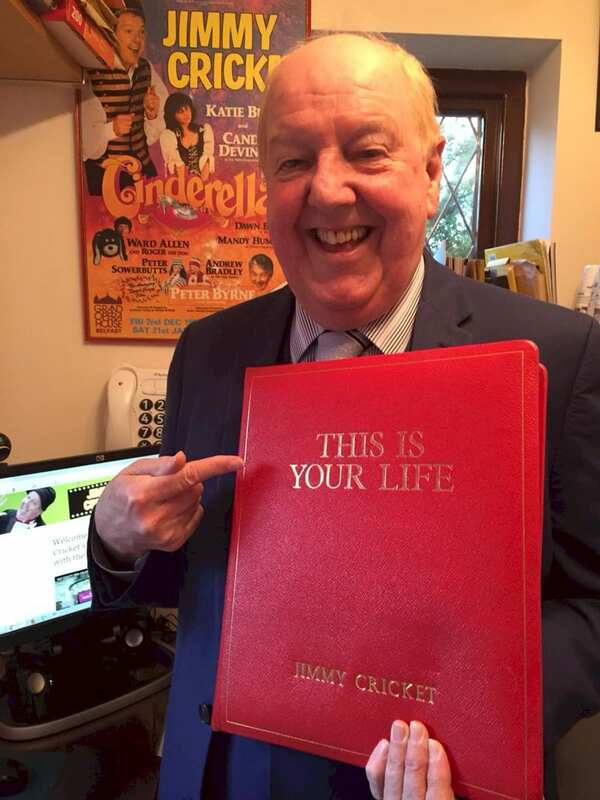 When I turned up at the building site the next day, I was gobsmacked to see not only Eamonn Andrews with his Big Red book, but my Sister –in-law, Evelyn at his side. Then when it came to the finish of the programme both May and her other sister were in tears when they saw Evelyn walk through the door. On a sadder note after recording another two episodes of, “This is Your Life”, Eamonn took ill and had to go into hospital. A few weeks later I was contacted by his widow Grainne who told me this episode was the last one he watched from his hospital bed before he passed away. Now in Eamonn’s memory, we hope you enjoy the show! Holding my famous ‘big red book’.